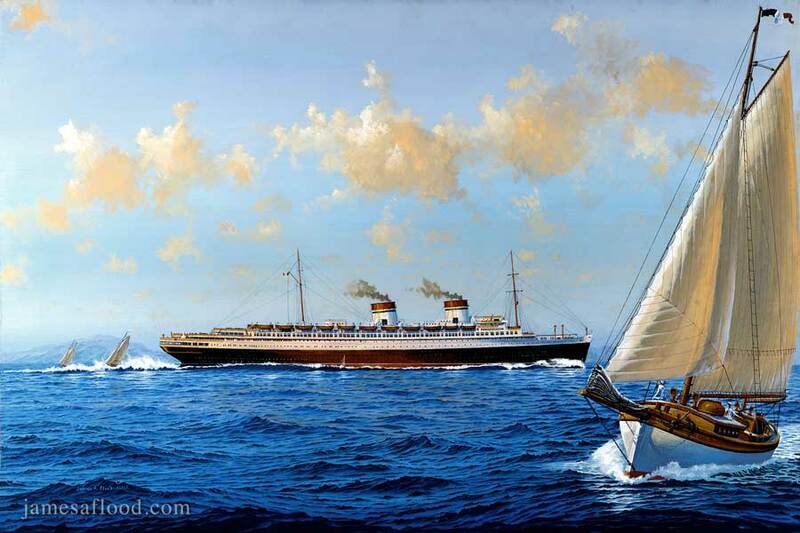 One of the most beautiful liners ever built, SS Rex is depicted in this painting in the Mediterranean, 1934, outward bound to the United States. In the background lies the coast of Italy. Cutting through the foreground, on port tack, witnessing sailors navigate a classic cutter-rigged yawl. Built by Ansaldo & Company, Sestri Ponente, in Genoa, Italy, 1931, the two-funnel liner weighed 51,062 gross tons, was 880 feet long and 96 feet wide. This magnificent record breaking Italian liner held the Blue Ribbon as the world's fastest liner from 1933 until 1935.